The Lake District National Park includes four mountains which are over 3000 feet which can be combined into a challenging event known as the Lake District 3000 Footers. We can structure this event in accordance with the specific requirements of the group and it can be done over one or two days in a 16 hour period. Scafell Pike and Scafell are summited consecutively via either the Corridor Route, Grains Gill or the shortest route starting out from the National Trust Campsite at Wasdale Head. Options for Helvellyn include the classic route from Patterdale ascending via Striding Edge and descending by Swirral Edge or alternatively, using the most direct route for the ascent/descent from Swirls Car Park at Thirlmere. Skiddaw is generally ascended via Millbeck or taking the easier option starting at a higher level from Latrigg. 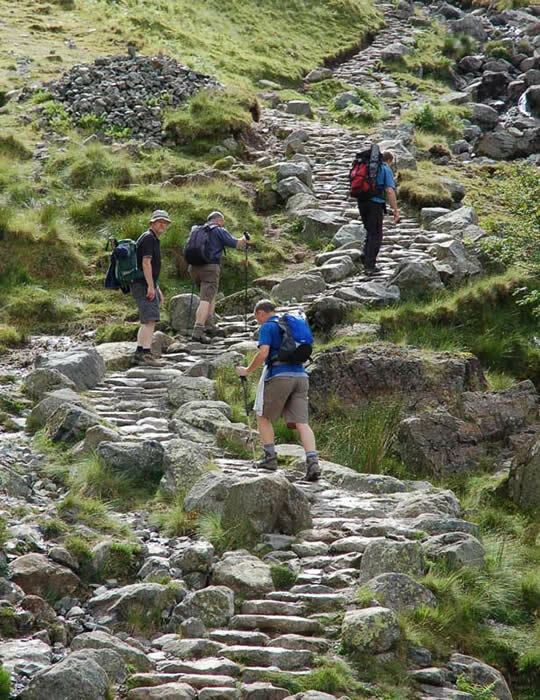 The Lake District 3000 Footers is regarded as a serious mountain challenge which involves walking over varied terrain and can be structured based on the ability of the group. Over a 16 hour period it is a strenuous exercise even using link transport between the individual mountains and ranks highly compared to the National 24 Hour 3 Peaks event. 1 Day: 16 hour event summiting all four peaks with link transport by minibus. 1 Day: 24 hour event summiting all four peaks using mountain bikes as link transport. 2 days: 2 x 8 hour event with link transport by minibus between the respective peaks. Maximum Group size: 24 or 2 x 24 man teams using alternative routing option.